What is the most famous J-horror movie ever created? It’s a quiz question that has only one answer…Ring. If you know horror, you’ve seen this movie & possibly its two sequels as well. Even if you’ve never seen the original an American remake (and American sequel) & a few parodies (Scary movie 3) ensure that in some way everyone knows about Ring. Now 17 years old as of 2015, its legacy can’t be understated. This is the movie that took J-horror into the public eye, the J-horror that helped inspire a legion of horror movies, the J-horror that spawned a glutton of copy-cats & made the girl with black hair over her face a nightmare for tens of thousands of people. I can still remember when I first saw Ring. It was the first J-horror I had ever seen. The year was 2003 & I had returned from a late-night drinking session. I put the TV on while eating & Ring was on…about 20 minutes in. I figured what the hell, I’m going to eat & then crash out anyway. When I did eventually go to bed it was having had my horror movie life changed. I couldn’t believe what I had just witnessed; I couldn’t believe that I could actually be scared by a film. From that point on I was hooked on J-horror. So…the movie opens with 2 teenage girls taking about a curse that is attached to a videotape. Supposedly when you watch this tape (which we all will while watching this movie) you will receive a phone call & then die 7 days later. One of these teens, Tomoko reveals to her friend that she & 3 others watched this tape 7 days ago. Tomoko is killed by something unseen shortly afterwards…her face twisted & contorted in fear. A few days later we meet Reiko, a reporter who is currently working on a report regarding the popularity of the video curse story. She discovers that Tomoko & her 3 friends all died on the same night at the same time. While investigating she finds out where the 4 friends stayed & goes there. She finds an unlabelled video tape & watches it. What we see are number of strange images (all incredibly unsettling & dark) that seem to offer little clue to what is going on. Straight after, the phone rings & a voice says ‘7 days’. Reiko, now a little freaked out enlists the help of her ex-husband Ryuji who also watches the tape. Together they discover a message within the tape that leads them to a small island. Things though take a turn for the worst when Reiko’s young son watches the tape having been told to by Tomoko apparently. On the island they hear about a powerful psychic who was accused of being a fake so committed suicide. Her daughter, Sadako went missing & the tape was made by her psionically in revenge. Believing that they have to appease Sadoko’s angry spirit the duo attempt to find out just what happened to her & where her body might lay. 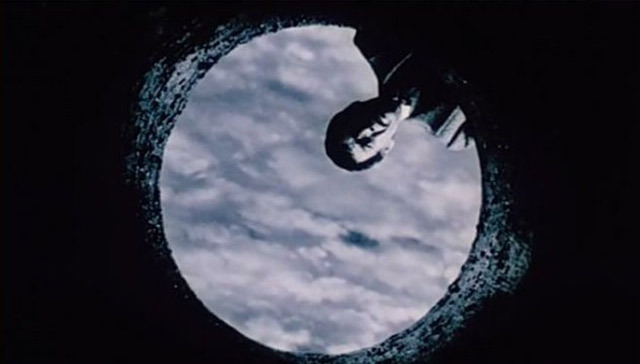 Ring’s build to its frantic climax is one of the major reasons why it is such a beloved film. No-one could have for-seen what would actually take place in the final minutes & is still one of the most chilling things I’ve ever seen. The imagery, particularly in the videotape itself, is incredibly haunting & will remain with you for a long-time afterwards. You’ll never look at a stone well in the same way again. Every actor involved in Ring excels in their role but particular mention has to go to Nanko Matsushima who plays Reiko & Hiroyuki Sanada who plays Ryuji. Their dynamic as ex-partners will keep your eyes glued to the screen but doesn’t focus too heavily on their relationship. Ring deals with several themes that reflect reality with the ostracising of those that are different being a major part of the movies plot. The use of modern (at the time) technology to spread a curse delved into peoples fear over the power that tech has on humanity with the spread of the tape being almost virus-like. Regardless of all that, if you’re looking to be scared then Ring is the perfect movie for you. Even now it still holds a lot of power to chill & leave you wondering just what could happen in 7 days. If you need to know where to start in J-Horror, this is it. Every horror movie fan should see this classic.